Engrained in our culture is the belief that unbending discipline is the only sure way to success. You must go to the gym five times a week, never order the dessert, and don't even think about buying that dress you keep staring at in the store window. Breaking from such a regimented lifestyle is a sign of weakness, right? Wrong!-and Joyce wants to tell us why... Though setting rules in our lives are important, it's just as important that we break them from time-to-time. Structure is a powerful tool, but when diverging from your own goals is seen as catastrophic, it can have a hugely negative effect on us. Balance is a core value in life and every once in awhile we deserve to indulge in a guilty pleasure or two. 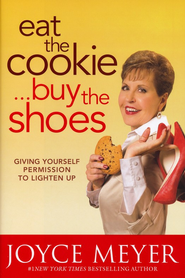 So don't feel bad about straying from your goals every once-in-awhile and in fact, embrace it: eat the cookie and buy the shoes!